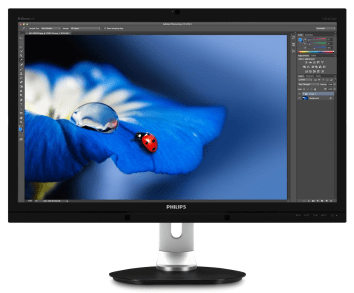 MMD, the leading technology company and brand license partner for Philips Monitors, announces a new display with UltraClear 5K resolution – the first 5K display in the line-up. With 14.7 million pixels (5,120 x 2,880), the Philips 275P4VYKEB display with 5K resolution packs four times as many pixels as Quad HD, and over 50 percent more than Ultra HD, delivering ultra-fine clarity and sharpness to amaze and delight even seasoned graphics professionals. The new 27-inch display is also equipped with PerfectKolor Technology, which ensures factory-calibrated 99% Adobe RGB, 100% sRGB colour space and one billion colours. The latest 5K resolution packs an extra 1,000 horizontal and 700 vertical pixels of display area compared to a 4k monitor, creating additional space to help busy users work more productively and effectively – there is space for an extra CAD tool window, for example, for comparing a series of photos or professional graphics, or simply to keep a mail window open. This also makes a second screen superfluous for many tasks, which helps to increase efficiency as well, as users can keep their eyes on one screen. With advanced PLS technology, the display also features extra-wide viewing angles of 178 degrees, ensuring viewing accuracy with razor-sharp visuals from just about any angle. Professionals who choose a display with super-fine resolution are likely to be equally demanding about colour accuracy. Inconsistent colour is simply out of the question. With PerfectKolor, the new 5K display provides factory-calibrated colour with 99% Adobe RGB and 100% sRGB consistency – so users can be completely confident that every colour exactly matches requirements. The colour is not only accurate; it is also smooth and sumptuous. With 10-bit colour support, the new display offers rich colour depth, and can represent over one billion different colours – more than the eye could ever distinguish. Thanks to 12-bit internal processing, colours are re-created smoothly and naturally, without gradations or the nuisance of banding effects. As well as offering brilliant, accurate colour and 5K resolution, the display is engineered with a range of features to fit the way professional users work, with webcam and microphone for collaborating and sharing with colleagues and clients, plus built-in speakers for lifelike sound reproduction. The Flicker-free technology keeps the eyes fresh even after hours of detailed work, and the SmartErgoBase, which can be tilted, swivelled and height-adjusted to individual preferences, ensures maximum viewing comfort. It also keeps cables tidied away, freeing more space on the desktop. To connect efficiently with data sources – vital for the data-intensive graphics applications common in professional environments – the new display also supports USB 3.0, with a transfer rate of 5 gbits/s, 10 times the speed of USB 2.0. It also allows fast-charging of a device simultaneously with the super-speed data transfer. The new Philips 275P4VYKEB display, with an RRP of £1,169.99, will be available at the beginning of April.